Made by Magazine Promotions Australia Pty. Ltd in Australia, Oceania, 1985. This poster has significance as a record of music in youth culture around the turn of the 21st century. It helps to illustrate how poster art was used to communicate information to a mass audience about rock music performers and specifically to promote concerts and CDs. 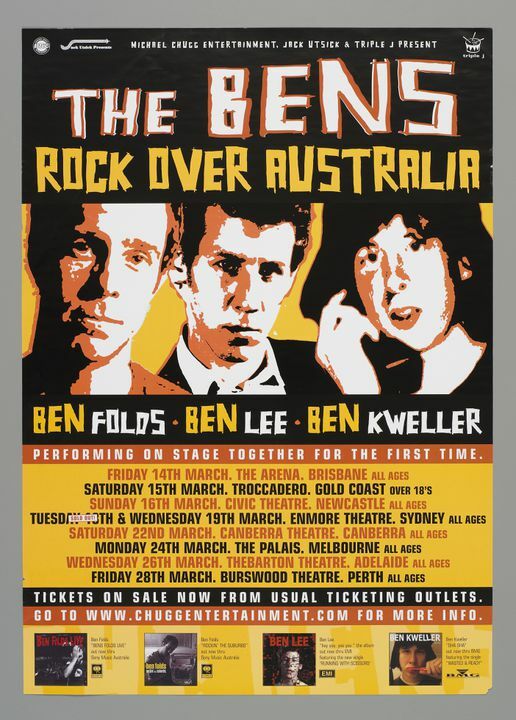 In 2003 Ben Folds, Ben Lee and Ben Kweller formed a triple bill on a tour of Australia. This poster illustrates how the tour was promoted as ‘The Bens’. Poster with black and gold background and an illustration of the three Bens. Text: 'The Bens. Rock Over Australia. Ben Folds. Ben Lee. Ben Kweller ...' Tour dates are listed. CD covers shown at bottom. This is part of a collection of posters, stickers and promotional cards accumulated by Peta Wilcox, of the Australian Rock Company, from bands, bookers and record companies through her extensive contacts within the music industry.